Santa Barbara is the American Riviera. The seascape. The weather. The architecture. The geography. The culture. Living here simply does not get better. Santa Barbara’s regional airport accesses larger air hubs and is also home to Stearns Wharf and a wonderful boat harbor with a small working fleet of fishing vessels. The collection of islands off the coast also provide wonderful boating adventures and the channel waterways between island and mainland are home to abundant sea life including a migratory route for whales going to and from Baja California and their homes to the far north. In the late 18th century the Spanish arrived to the area as part of their California exploration and settlements. They built the Presidio in Santa Barbara, the Mission Santa Barbara and the Mission Santa Inez farther west in the Santa Ynez Valley. As part of this process the Spanish deeded large land grants to families who helped with their settlements and for the next century, the area was ranched and farmed. The “go west” idea that encompassed much of the United States during the 1800′s brought other settlers, drawn to the area by its beauty and weather. The harbor enabled building supplies to be brought, including redwood, and over the years the City of Santa Barbara was built and developed. A large earthquake occurred during the late 1920′s that proved to be pivotal event, forever changing the architectural look of Santa Barbara. Many of the buildings and much of the infra structure of Santa Barbara was destroyed. 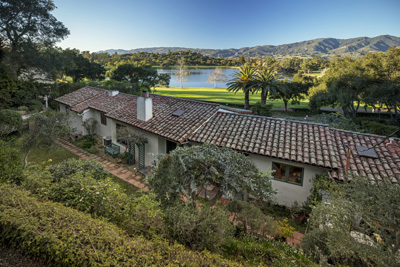 A group of individuals and architects decided, that in the rebirth, a Spanish / Mediterranean architecture would prevail in the rebuilding of the town and now today, the wonderful tile roof architecture is prevalent throughout Santa Barbara. 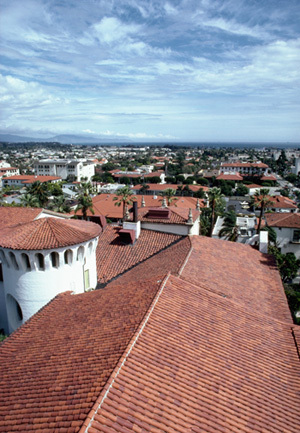 Santa Barbara is also a university town. The University of Santa Barbara has helped spawn a lively tech business environment for the community as well as providing a cultural and intellectual base of activities. The regions beautiful beaches, majestic mountains, tile roof architecture and colorful culture make the town a world class premier destination to live, work and play. Santa Barbara is the jewel of United States West Coast! 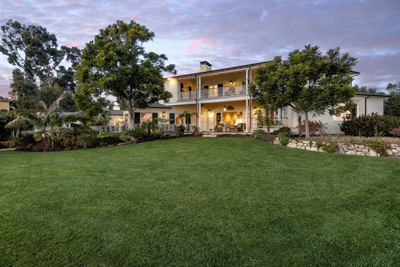 A showcase hilltop estate for large-scale entertaining, this lovely estate has been elegantly restored to perfection and offers the quintessential California coastal lifestyle with a tropical flair.